Check the website regularly for any last minute course changes or news. Please turn up early to set up your equipment in transition and listen to the race briefing. Generally sign on begins at 7.15, race briefing at 7.40 and 8am start. Sometimes when the sea conditions are bad (i.e. too rough or water is too cold) we have either cancelled the race or raced a duathlon instead. The use of MP3 players is not allowed, neither on the run, bike or even swim! At registration, please collect your race number if you don’t already have one from previous races. For those of us who like stats, we try and give split times. So at the end of the swim, bike and run it is a good idea to shout out your race number, to help out the timekeepers. This is why we write your number on your hand at registration. Your race number should be pinned on a tri belt. If you do not own one, we have some in the club van that you can borrow. The number should be rotated, so that it is to your back on the bike and to your front on the run. The start of a sea swim can sometimes be intimidating. When there is a large turn out for a race, the start can sometimes get a bit messy! If you are a slower swimmer, try and start to the back or edge of the line up. If you are in trouble in the water, simply lie on your back with an arm in the air and a kayaker will come and assist you. When they get to you simply grab the front of their kayak, not the kayaker or paddle, otherwise there maybe two people in need of assistance. Please do not try and get fully out of your wetsuit before the transition area. Otherwise it can get quite congested, trying to jump over someone when you have post-swim wobbly legs is difficult! Some people will get the top half of their wetsuit down, before transition, to save time. Try and keep the transition area tidy at all times, especially wetsuits, as they can be a serious tripping hazard. It is compulsory to fasten your helmet before taking your bike from the rack. There will normally be a mount / dismount line on the edge of transition. Cycling can only commence once outside the transition area. 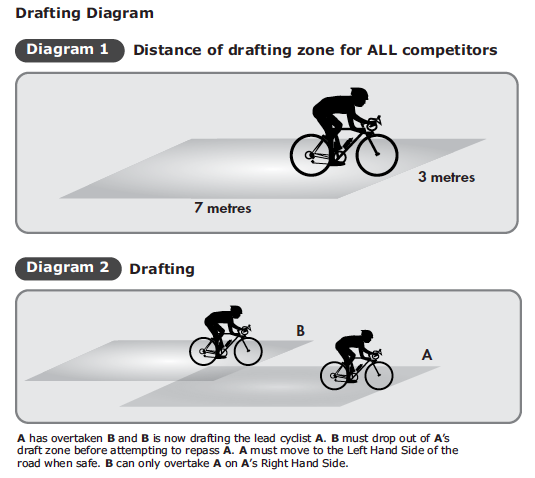 Basically to make the cycling section fair and safe, you must not shelter behind another cyclist, keep outside the zone of the cyclist in front. If overtaking and entering the zone of the cyclist in front you must do so within 30 seconds. Use common sense on the roads, as the roads will not be closed, caution and normal rules of the road apply. Anyone caught being ‘naughty’, will be disqualified! On some races we will have draft busters out on the course. If anyone is drafting they will either have a time penalty or be disqualified. Marshalls will be out on the course at key junctions with a bib and a red flag. Please obey their instructions. If you have an accident or mechanical, or leg failure and can no longer continue with the bike section, please let a marshall, timekeeper or organizer know. Upon completion of the bike section, please be sure to dismount before the dismount line. If you have any time to spare, any help with setting up and packing up transition is always appreciated. Finally have a safe race and try not to take yourself too seriously, its meant to be fun.